When Kelli returns home from war, she expected to settle back into her life with her husband and kids. Instead, she finds herself lost in a world that no longer feels familiar or makes any sense. $6.717 thousand on 3 screens. Films about the difficulties encountered by war veterans go far back into cinematic history, but 2011’s Return delivers a twist: a female point of view. After she comes back from Iraq, Kelli (Linda Cardellini) hopes to slide back into her old life with husband Mike (Michael Shannon) and kids Jackie (Emma Lyle) and Bree (Tabitha and Victoria Depew) as well as her factory job. All seems fine at first, but eventually, the challenges of civilian life start to overwhelm Kelli. Everything feels pointless to her, so she quits her job and starts to detach from friends and family. We follow her attempts to deal with her new realties and complications that come along the way. 10 years ago, Cardellini seemed like an actor on the rise but she then fell into the “where are they now?” file. That’s not entirely fair, as she continued to do a lot of work; Cardellini’s primary gig for much of that time came from her “day job” on ER from 2003 to 2009. Still, I think Cardellini faded from public view to a large degree, so I’m happy to see her back in a lead role here. I liked her going back to Freaks and Geeks days and found her to be a rare highlight of the Scooby-Doo movies, so I welcomed the ability to see her in a cinematic lead. I just wish she’d ended up in something with a little more meat than Return. Granted, it never threatens to become a bad film, and I like its fairly low-key attitude. Many efforts of this sort would tend toward the overwrought, melodramatic side of the street, but Return generally avoids that tone. It tends to be a low-key observation of life without excessive histrionics. Occasionally you might wish for some of those usually-annoying histrionics, though, as you might hope they’d add some spark to the proceedings. While there’s definitely a plot/character arc at work here, Return does tend to move slowly, and it sometimes feels like it’s just treading water. I realize that a story like Return falls into “rock and a hard place” territory to a degree. On one hand, too much character drama can become artificial and forced, but too little seems monotonous. The film achieves a bit better balance as it proceeds – we definitely get more movement in the second half – but it still tends to plod. It also doesn’t seem especially sure about what it wants to say. 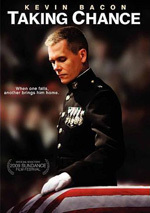 I get its overall point – that even soldiers who “had it easy” in war remain seriously affected by their experiences – but the movie doesn’t explore this notion in a particularly solid manner. Indeed, it tends to undercut its point via Kelli’s protestations that she didn’t have a tough time in Iraq; at first this seems like denial, but eventually we start to believe her and wonder why she’s such a mess. Cardellini does offer a good lead performance in a challenging role. As noted earlier, I’ve seen her in mostly comedic roles; Freaks and Geeks straddled comedy and drama but wasn’t as “serious” as this. Cardellini delivers a believable take on the character and doesn’t overplay the part. The supporting cast also seems fine, though I think Shannon gets stuck with a role not quite worthy of his talents. Mike essentially does little more than act like the stereotypical “nagging wife”; he’s right in what he says/does, but the film doesn’t allow him much understanding/compassion, especially since it makes the unfortunate decision to portray him as a cheater. That choice has little bearing on the story and does nothing more than make some of Kelli’s bad actions appear a bit more justifiable. I also think that Return doesn’t do enough to explore the gender-related topics involved. As I mentioned at the start, we’ve seen stories like this in the past, but not usually from the female POV. Return fails to take advantage of that twist, as I believe one could easily recast Kelli as “Kenny” and Mike as “Michelle” and nothing would need to change. Why bother to go for the female side of things if you don’t plan to alter the standard framework? Despite these criticisms, Return remains a decent drama – it’s just not one that turns into anything exceptional. It offers a generally interesting character piece with enough insight to keep us involved but not enough to take it to a higher level. Return appears in an aspect ratio of approximately 1.85:1 on this single-sided, double-layered DVD; the image has been enhanced for 16X9 televisions. This was a perfectly decent SD-DVD presentation. For the most part, sharpness seemed passable. Some light edge enhancement didn’t help, and artifacts made the image a bit messy at times, so wide shots tended to be soft. Nonetheless, the movie usually offered acceptable definition. Shimmering and jaggies didn’t become an issue, and source flaws remained absent. Colors weren’t much of a concern in this fairly subdued affair. Given the nature of the story, I didn’t expect dynamic hues, and the film tended toward a brownish look much of the time. What colors we found seemed decent but unexceptional. Blacks appeared reasonably deep, and shadows looked acceptable; some low-light shots were a little dense, but this didn’t become an issue. All in all, this was an average SD image. Though not especially ambitious, the Dolby Digital 5.1 soundtrack of Return seemed satisfactory. The mix usually focused on general environment, and that side of things worked well. The audio used the speakers in a natural manner that created a good soundscape. Music also featured nice stereo imaging, and the surrounds contributed to the ambience. The back channels didn’t have a lot to do, but they added to the film’s aura. The whole package connected together in a reasonably involving manner. Audio quality was positive. Music showed nice range and clarity, while effects offered good accuracy and punch. The smattering of loud scenes showed solid definition, and they lacked distortion. Speech was also concise and natural. Nothing here dazzled, but it achieved its modest goals. When we shift to extras, we find an audio commentary from writer/director Liza Johnson and cinematographer Anne Etheridge. They sit together for this running, screen-specific look at story/character subjects, cast and performances, sets and locations, camerawork and visual design, the rushed shooting schedule, music, and a few other areas. Expect a pretty “meat and potatoes” track here. Johnson and Etheridge cover the appropriate topics in a fairly engaging manner, but the commentary never manages to rise above the level of average, and it comes with occasional lulls. We learn enough to make the piece worth a listen, but it’s not a scintillating chat. Five Deleted Scenes run a total of five minutes, 50 seconds. We find “Dancing”, “Bubble Wrap”, “Military”, “Christmas Store” and “Skateboard”. Four of the five tend to be insubstantial – heck, “Skateboard” is really just an outtake – but “Store” is pretty interesting. In it, we see Kelli at a temporary gift-wrapping gig when she goes off at a rude customer. I’m glad it didn’t make the final cut – it’s too much of a stereotypical “angry veteran” scene – but it’s still intriguing. The disc opens with an ad for Worried About the Boy. 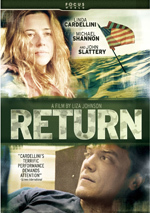 We also locate the trailer for Return. With its emphasis on the female point of view, I hoped Return would provide an intriguing twist on the standard war veteran drama. While it occasionally does so, it usually seems like a standard issue story; it’s a decent film but not one that stands out from the crowd. The DVD offers acceptable picture, good audio and a few useful supplements. I think Return delivers an average film and DVD.